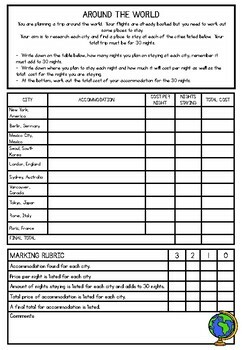 Around the World Numeracy Assignment - Budgeting & Operations. Inquiry Based Maths Assignment Around the World - Extend learning of budgeting & operations with links to the real world. Grades 3-5. Enrich and extend your students' understanding of budgeting and basic operations with this simple but effective around the world assignment. Students link their learning to real life by researching accommodation for a range of cities around the world and budgeting for a holiday. Perfect as an extension for those early finisher or just as an assignment at the end of a place value and operations module. This work beautifully for my more advanced students who needed a deeper learning of addition and other operations.